Mezin scene. Two skulls with tusks form the arched entrances, the tusks being joined by a hollow leg bone. Antlers were woven together to help form the roof. Note that the entrance was apparently screened with a mammoth hide door. 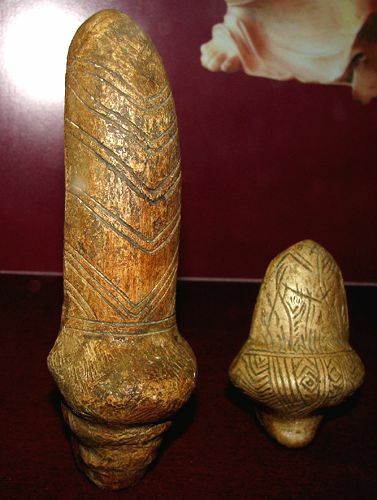 These sculptures and others like them from Mezin have been variously described as phallic figurines, birds, and bird/woman hybrids. 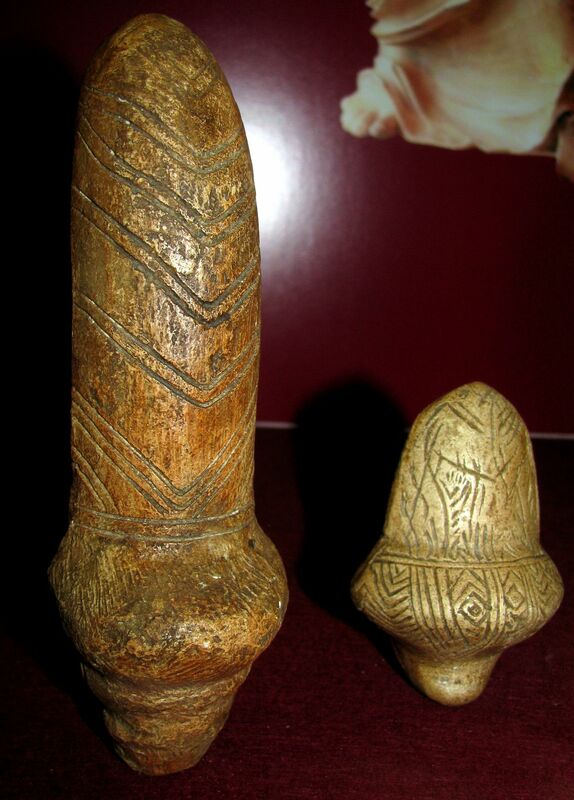 They were made originally in Mammoth ivory. 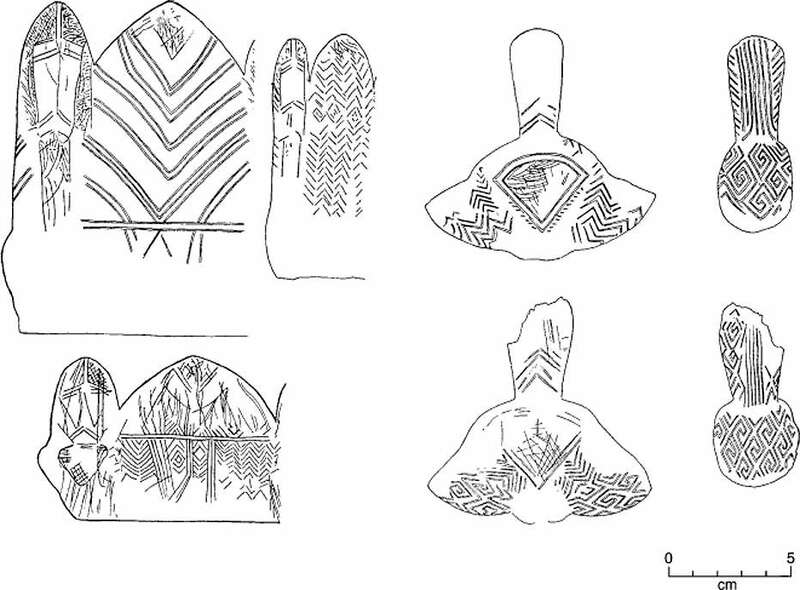 Highly stylised female figurine from Mezin, showing a decorated and an undecorated side. 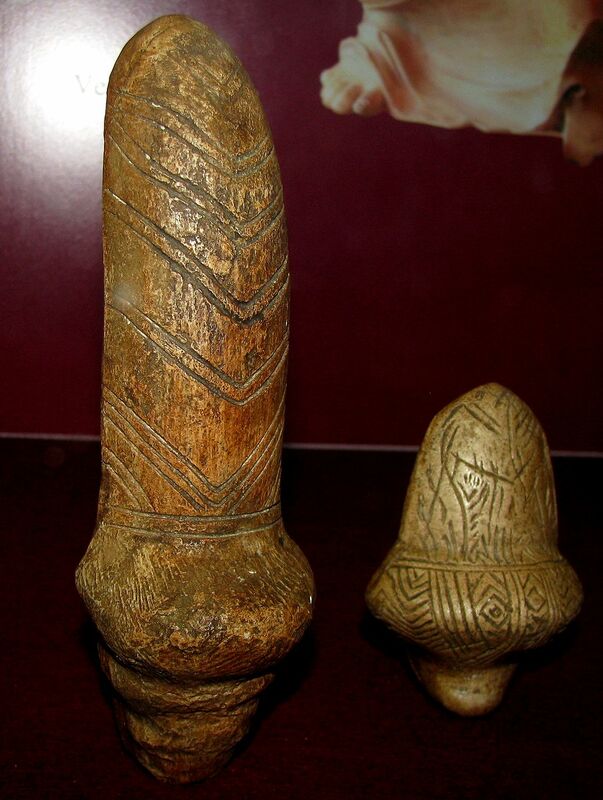 Stylized female figurines of mammoth tusk from Mezin. 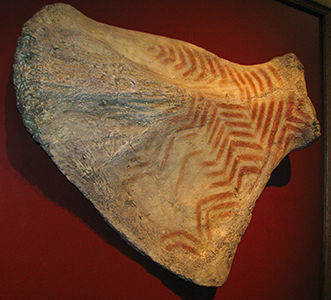 15 000 BP, Late Palaeolithic. 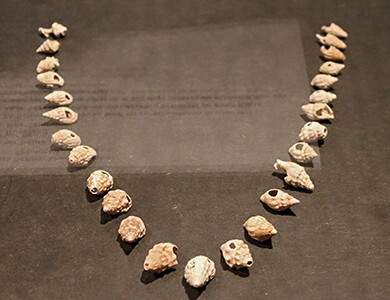 Necklace of contemporary marine shells and fossils from Mezin. 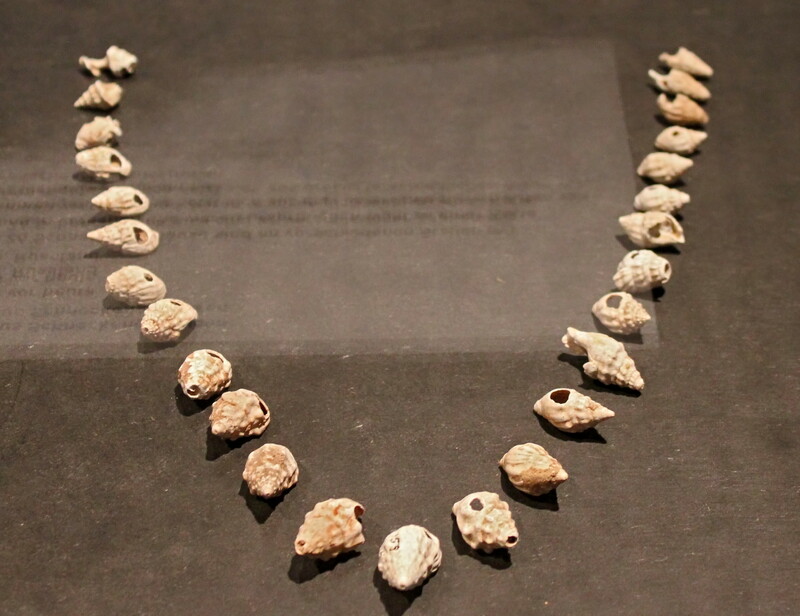 These 26 sea shells have been perforated at various points and were originally combined into a chain. It is composed of three different types of sea shells. On loan from the Hermitage Museum, Saint Petersburg, Russia. 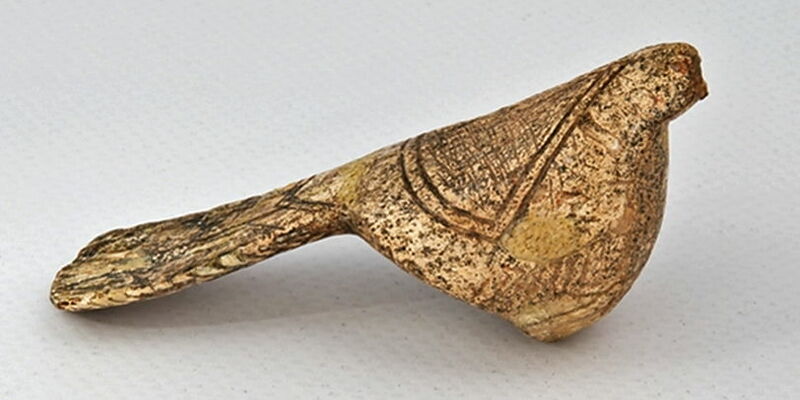 Stylized female figurine from Mezin. 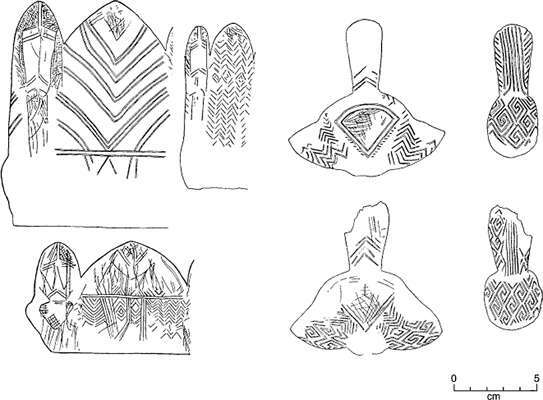 Design motifs on some Mezin figurines. Statuette féminine sculptée avec double triangle pubien et chevrons gravés de Mezine - Collection MNIU - Photo L. Iakovleva. Female statuette carved with double pubic triangle and engraved chevrons, from Mezin - Collection MNIU - Photograph L Iakovleva. 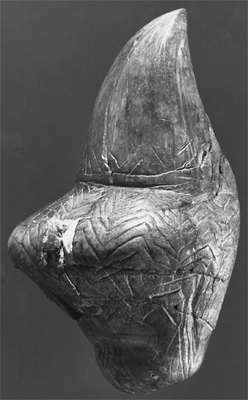 Stylized female figurine of mammoth tusk from Mezin. 15 000 BP, Late Palaeolithic. (This photo gives a much better idea of the general form of the statuette above, and highlights the dual nature of the bird/venus motif. 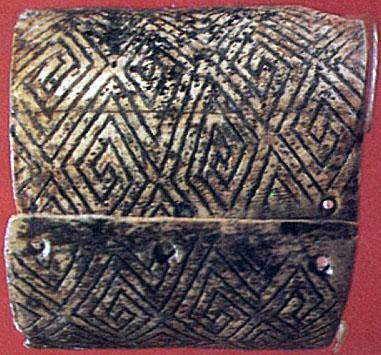 Bracelet of mammoth tusk from Mezin ornamented with a geometric design. 15 000 BP, Late Palaeolithic. 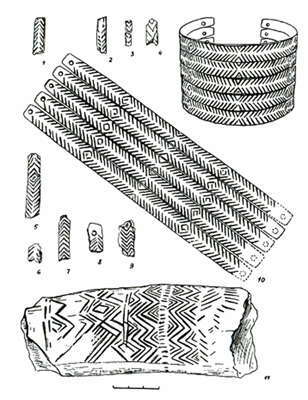 10 recreations of the fragments as bracelets and a diagram showing the complete recreated design. 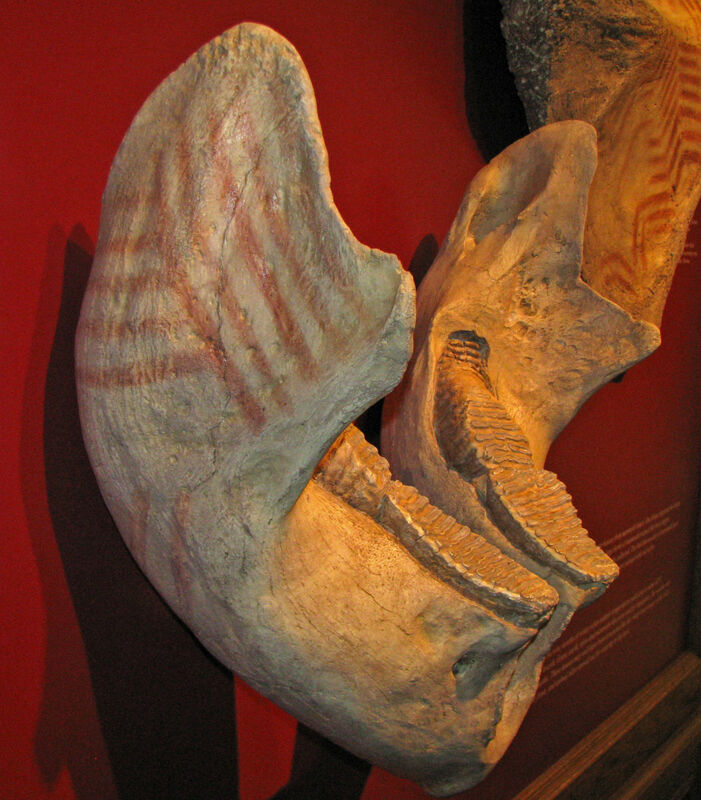 11 fragment of a decorated mammoth tusk. 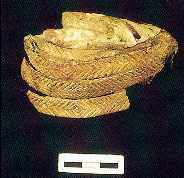 Bracelet gravé en ivoire de mammouth de Mézine. Collection IA NASU. Bracelet engraved out of mammoth ivory from Mezin. Collection IA NASU. These shoulder blades and jaws of mammoths have been decorated and may be musical instruments, played by striking. Northern peoples today, such as the Eskimo and Samoyed, always have a dance hut in their villages. This is the same size as a dwelling, but is set aside for song and dance, entertainment and ritual, and is used especially in the festivals of autumn and winter, at the start of the winter hunt. 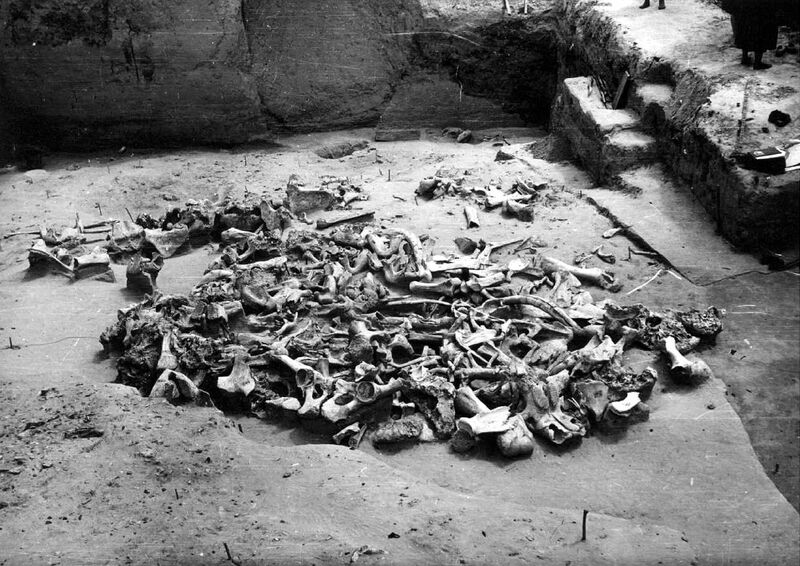 The site of Mezin in the Ukraine, dating to about 24 000 years ago, contains a mammoth bone hut which may have been devoted to a similar use. Although the interior space was probably too constricted by roof supports to allow for dancing, the floor appears to have been kept clear of domestic refuse - a sign that it was perhaps used for ritual purposes. 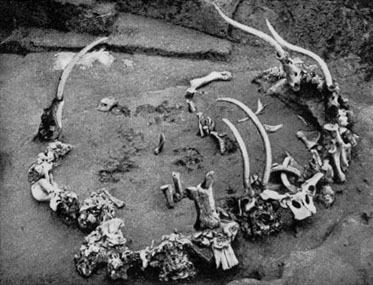 A set of mammoth bones painted with red ochre and a reindeer antler hammer were found in a group on the floor of the hut. Originally they were thought to be art or cult objects. However, subsequent analysis revealed areas of surface damage on all of them, as well as signs of smoothing, thinning, polishing or rubbing. The conclusion must be that they formed a set with some common function that involved concentrated blows, as well as rubbing and polishing through prolonged contact with hands and perhaps fur clothing. 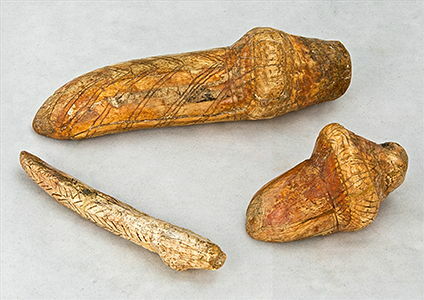 The reindeer antler has the polish of long use on its handle, while its working surfaces are very worn and its spongy pores have reddish ochre in them, picked up from the decorated surfaces on the mammoth bones. 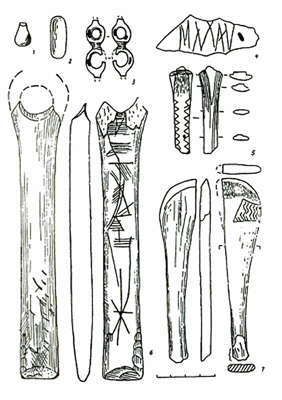 A controversial interpretation of this evidence is that these bones were used as musical instruments, in a kind of ice age orchestra. The bones were presumably percussion instruments, struck with hammers. 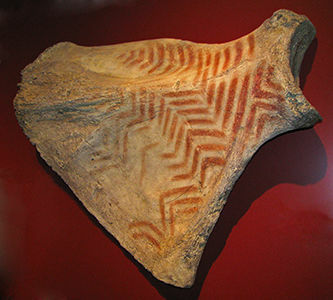 A mammoth shoulder blade, decorated with linear and zigzag stripes in red ochre, bears traces of polish on the neck, corresponding to the positions of the palm and thumb, suggesting that this was where it was held with the left hand, while the right hand struck the body of the instrument with a hammer. 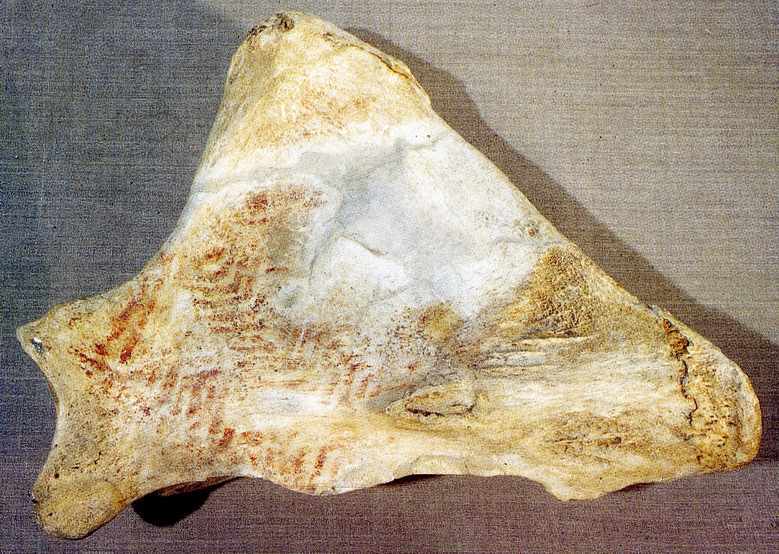 Other areas of wear possibly indicate that the bone was hit in different places to vary the tone of the note produced. A femur had had the soft, spongy material extracted from inside, perhaps to increase its resonance. It may have been played horizontally, like a xylophone, perhaps on a support rather than on the ground, judging from other polished areas. 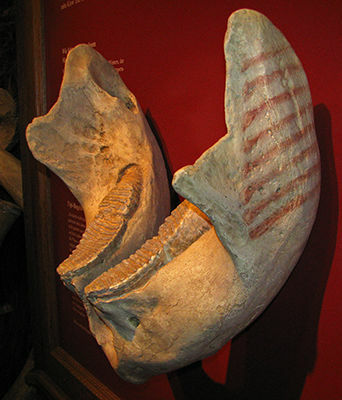 A half-pelvis and two jaw bones, likewise painted with red parallel stripes, appear to have been used in a similar way. 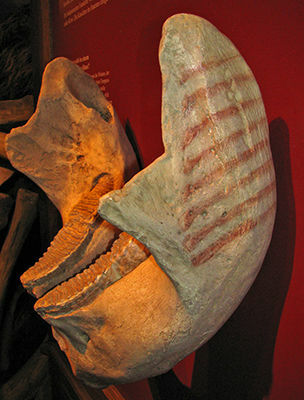 The two jawbones were placed on their undecorated left sides, and the right sides - both painted with red stripes - were struck. The teeth were removed from one of them, perhaps to alter its resonance. A piece of bone from a skull, decorated with spots of red colour, was probably used as a drum: the cranium's cellular structure creates an unusual resonance, as experiments with modern elephant skulls have shown. 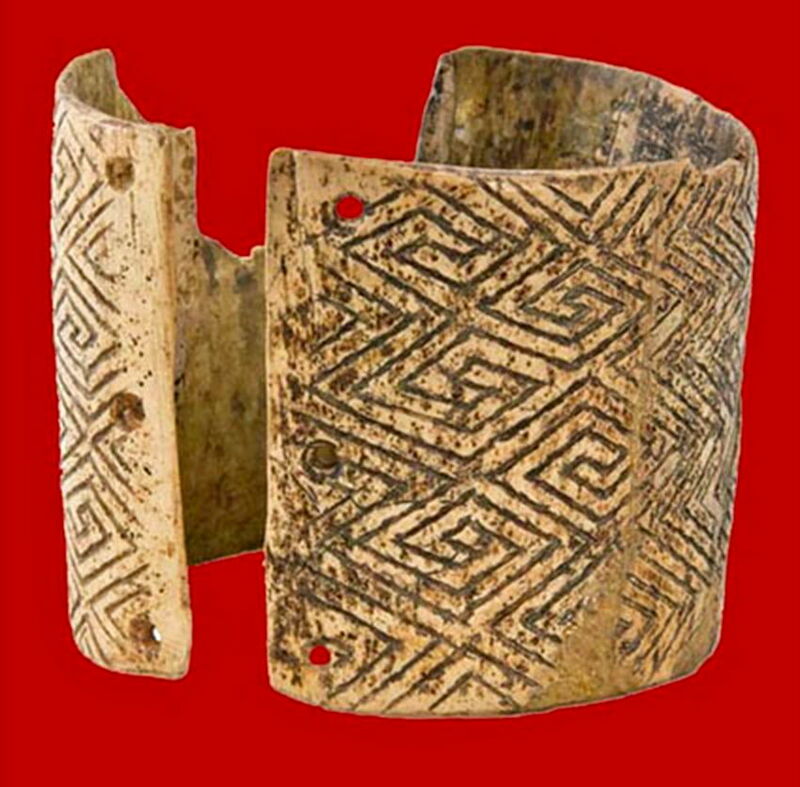 Finally, among this set of bones was a 'bracelet' made of five very springy rings of ivory, perforated so that they could be tied together, and all incised with a herringbone design. This too may have been a kind of musical instrument, producing a sound similar to castanets. 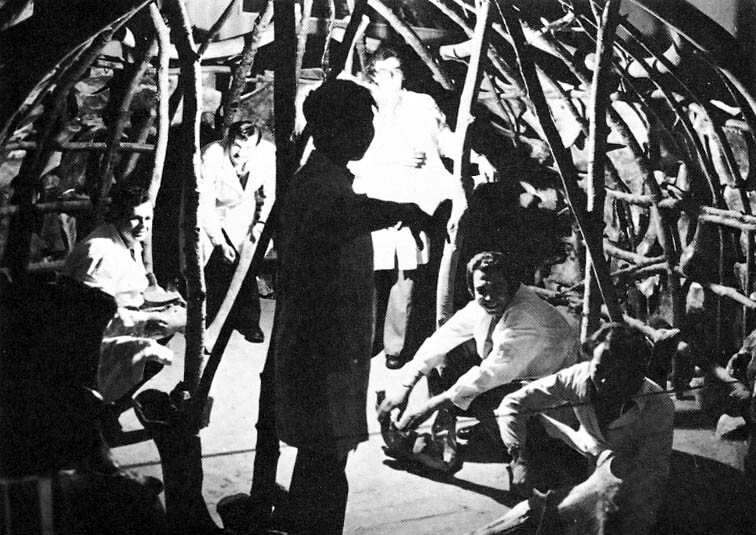 The hut also contained two or three kilograms of red and yellow ochre, in four concentrations, as well as bone pendants, needles and awls: some scholars have suggested that these may have been used to prepare theatrical performances. After restoration and conservation at the Hermitage museum, all the original Mezin instruments were played with bone hammers by a collection of percussionists under the direction of VI Kolokolnikov of the Kiev State Philharmonic. The musicians were able to produce a variety of resonant sounds using their knowledge of the music of northern peoples today, and were able to give a rendering of what Ice Age music might have sounded like. 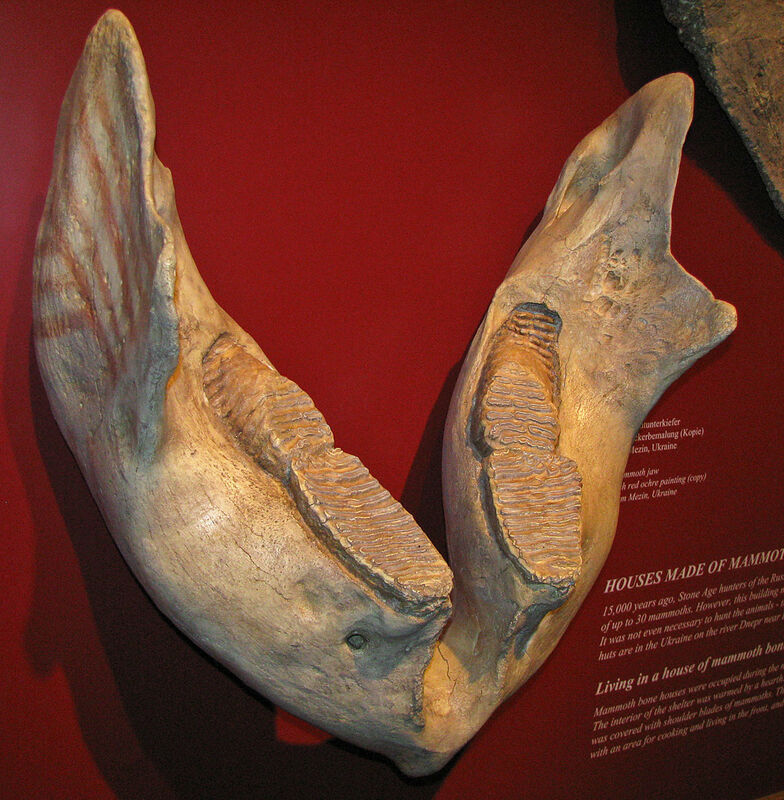 The jaws had slightly different decorations on the left and the right. The right side, shown in these two photographs, has a series of lines nearly at right angles to the rest. The lines appear to have been drawn with a finger. 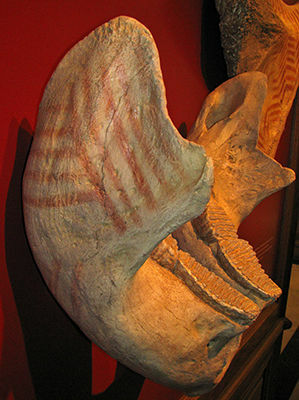 This view of the painted jaws shows what may be damage from drum sticks on the inside of the left jaw. and a "rattler" made from mammoth jaws. The site of Mezin is located on the Desna River approximately 25 kilometres downstream from the city of Novgorod-Severskii in the Ukraine. The occupation area lies on the lower slope of a large tributary ravine near its confluence with the main valley, approximately 10 metres above the modern river bed. The artifacts and features are buried in loess-derived colluvium, and their stratigraphic and chronologic position is not well defined. Three radiocarbon dates obtained on mammoth teeth yielded ages of 29 000, 21 600, and 15 100 years BP. 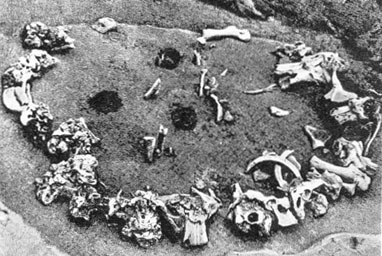 Mezin was discovered in 1908 by F. K. Volkov, and was excavated over the course of many decades by Ukranian and Russian archeologists such as Efimenko, Voevodskii, and Shovkoplyas. Omoplate de mammouth peinte utilisée dans la construction d'une des cabanes de Mézine. Photo L. Iakovleva. Painted mammoth scapula used in the construction of one of the huts of Mezin. This appears to be very similar to the scapula depicted above, rotated through 180°. Photo L Iakovleva. Aiguille à chas gravée de chevrons en ivoire de mammouth de Mézine - Collection MNIU. Mammoth ivory needle with eye, engraved with chevrons, from Mezin. Collection MNIU. 1-2 Beads in the process of being made, in yellow amber. 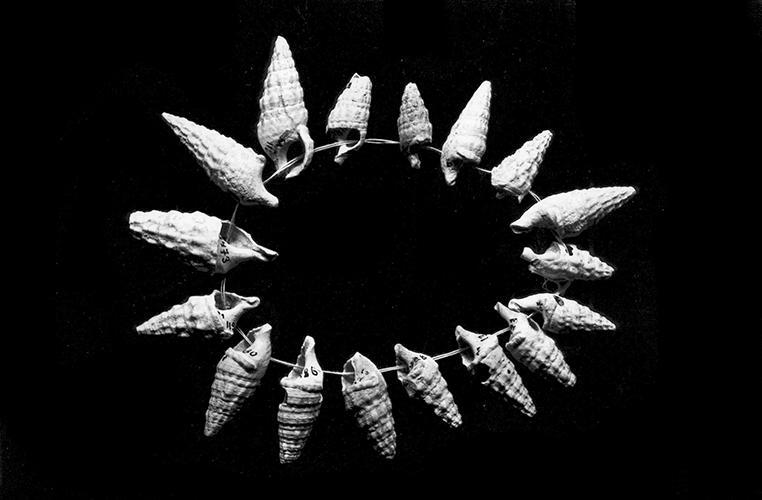 3 Labelled a broche en ivoire, this looks like ivory beads in the process of being made. 4 Fragment of engraved bone. 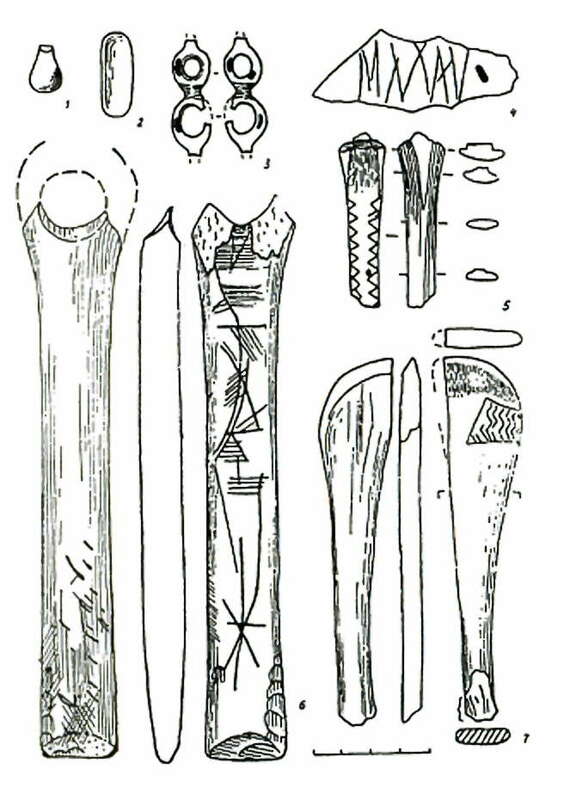 5 Fragment of a decorated rod. 6 Baton percé, a spear straightener. 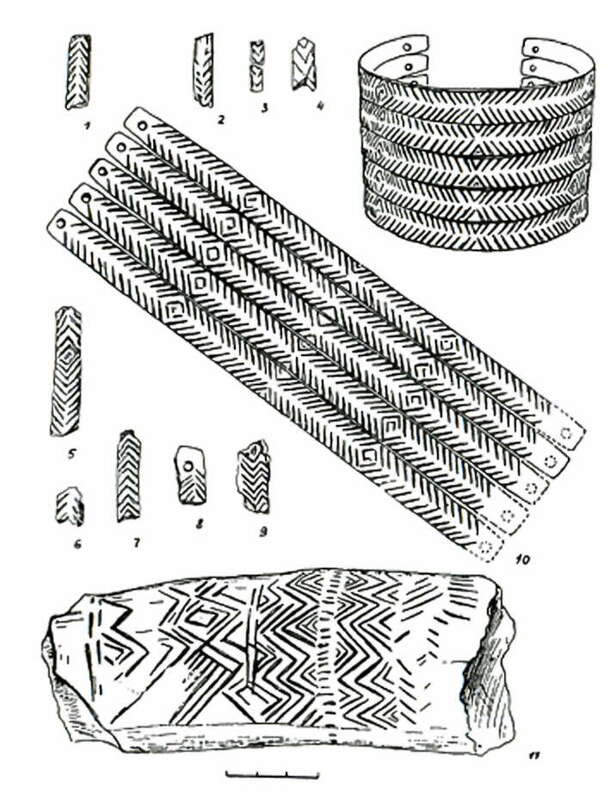 7 Fragment of a decorated scoop. The Chernigov Regional Historical Museum by V. Tarnovsky is the oldest and best known in Ukraine. It was founded in 1896. 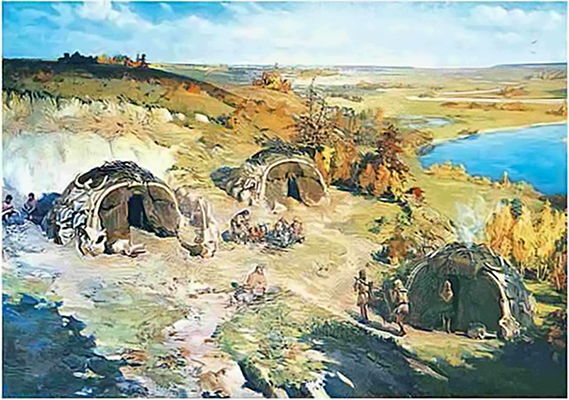 The settlement of Mezin is one of the oldest in Ukraine and belongs to the Paleolithic. Excavation showed that it consisted of five household complexes. The time of the settlement existence may account for 22-23 years. At least seven families totalling 50 people lived there. 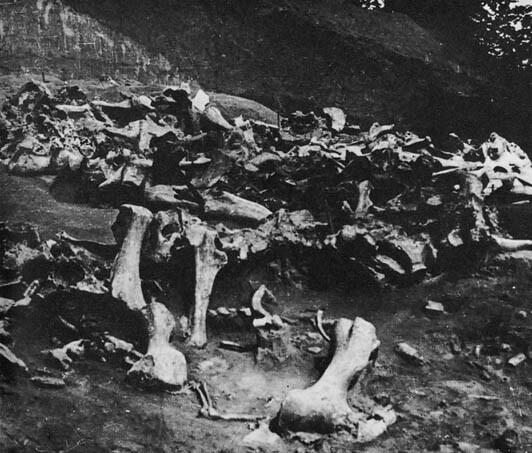 They hunted for large animals and in most cases for mammoths. 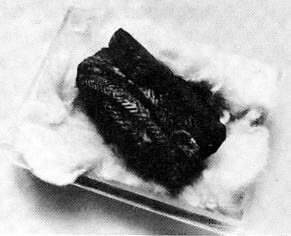 Collective hunting gave them food, skins for covering dwelling houses and clothes. 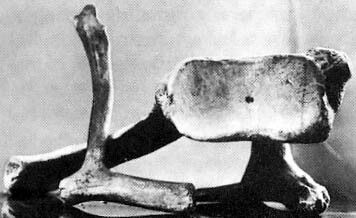 Bones of large animals were the best building materials at that time. On display in the museum are bones of mammoth's shoulder, lower jaw, and tusk. 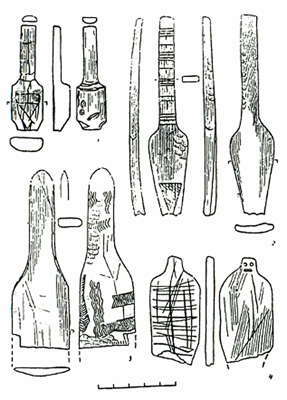 Flint tools are widely represented by various cutters, scapers, and prickers. The Mezin settlement have become famous of their works of art. The inhabitants made ornaments from mammoth's bone, and liked decorative items made from cockleshell. The settlement of Mezin is celebrated for its oldest musical instruments complex, which consists of an ornamented mammoth shoulder, antler hammer, noisy bracelet. The inhabitants performed their dances under this music more than 20 000 years ago. Gönnersdorf (Rhénanie-Palatinat), Magdalénien supérieur, vers 12 600. Cette reconstitution réaliste de l'habitation no 1 (Ø = 7 m) s'inspire librement d'une yaranga tchouktche; la carcasse en bois dont le toit s'appuie sur un mât central est recouverte de peaux de chevaux, l'entrée cloisonnée largement ouverte au sud-est laisse voir le dallage de schiste et le support d'une broche à un fémur de mammouth. Gönnersdorf (the Rhineland-Palatinat), higher Magdalenien, around 12 600 BP. This realistic reconstruction of the dwelling No 1 (diameter = 7 m) is similar to a yaranga (the traditional circular dwelling tent) of the Tchouktche people of Siberia. The structure's roof is supported on a central pole and is covered with horse hides, the partitioned entry opened to the south-east lets us see the schist (flag stones) pavement and the femur of a mammoth. 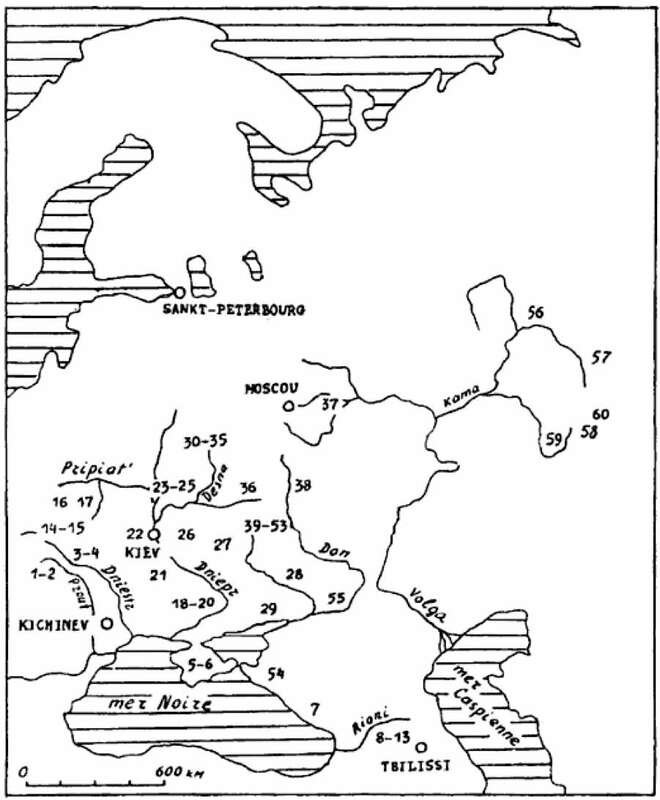 The palynological spectra of Mezirich site (Middle Dnieper area), that is about the same latitude as a Rogalik-Peredelsk group, marks undoubtedly prevailed steppe periglacial landscape. The pollens of a birch, alder and pine are rather individual (Dolukhanov, Pashkevich, 1977; Kornietz and all., 1987, p. 109). Plan du pourtour de la cabane n°1 de Mézine d'après le document I. G. Chovkoplass. Relevé des ossements de mammouths ornés d'après L. Iakovleva. Plan of the circumference of the hut n°1 of Mezin according to the document by I G Chovkoplass. 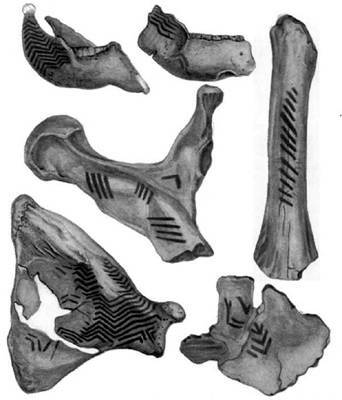 Plan of the bones of decorated mammoths according to L Iakovleva. Mezin, like many other sites on the central Russian plain, was discovered during excavation for a cellar. It was excavated at various times from 1908 to 1961. Its position is at 51 deg 45 min N, 33 deg 05 min E.
Cultural remains were located on the left-bank promontory of an old ravine that cut through the interfluve deposits. The ravine is located on the north (right) bank of the river in an area where the interfluve plateau first gently descends to the river and then abuts the river in steep 40-70 m cliffs. The site was open to the south and protected by the plateau to the north. (The site is considered to occupy 1200 square metres) Shovkoplyas also reports finding five storage pits with large bones up to 0.6 m below the level of the hearths outside Dwelling 1. The hearths were a part of the cultural layer, they overlie the storage pits, and are separated from them by a sterile layer of colluvial loess. The promontory on which the cultural layers were deposited is today 10-12 metres above the river, approximately 300 m up the ravine from its entrance into the Desna. Shovkoplyas explains the absence of a second cultural layer on the level of the storage pits by a rapid downslope erosion that purportedly occurred when man first occupied the promontory - possibly during a spring thaw. 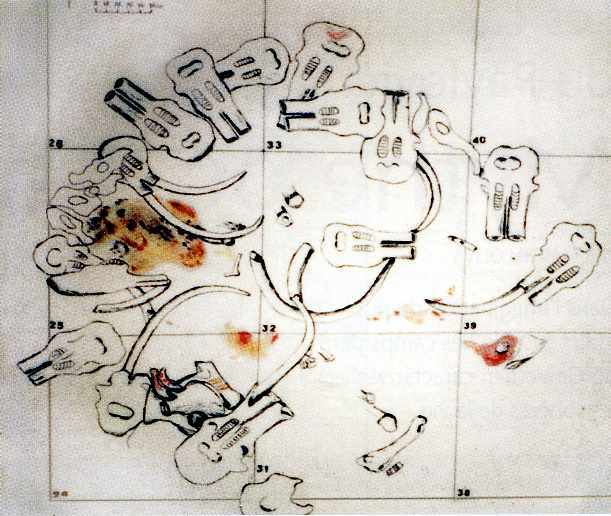 The map in Soffer's book shows five mammoth bone houses in a row. 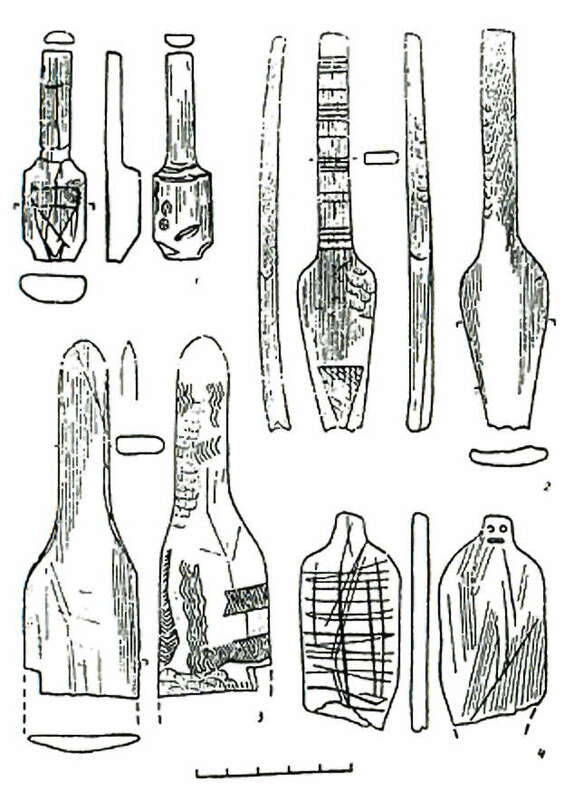 Soffer states that bone tools including eyed needles were found at the site, and that portable ivory art included figures variously described as phallic figurines, birds, and abstract representations of the female form.